Seven secrets to a healthy relationship with your boss. Two weeks before school let out, I had a breakdown in my principal’s office. When I say “breakdown” I mean sobbing, tears, probably snot, the whole nine yards. It was devastatingly embarrassing. I am an extrovert, but I keep my emotions mostly to myself. Very few of my closest friends have even seen me cry. So, as you can imagine, this was a weird experience. Thankfully, I was in the office of a sweet English teacher-turned-principal who was understanding and supportive. 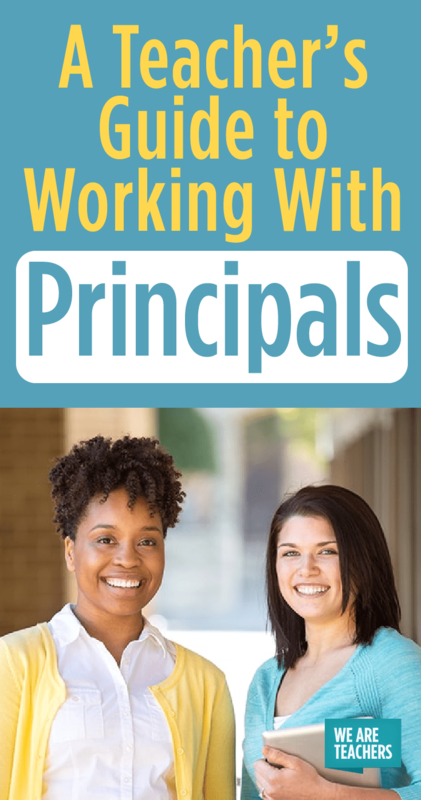 Working with principals can be a challenge, but I have strived to develop relationships with most of my admins, so this experience wasn’t nearly as bad as it could have been. Our relationships with principals matter. Here’s why. They’ll think of you. When an opportunity comes up that you might want (or even one you didn’t know about), your principal will think of you but only if he or she knows you and your interests. You can ask for what you want. Eventually, you are going to want something: a schedule change, a grade-level change, a favor, etc. If you do not have a relationship with your principal, then you will be more nervous to ask and less likely to get what you want. Don’t get me wrong, you won’t always get what you’re hoping for. But at least your request will be heard and considered. You’ll get respect and recognition. You probably didn’t get into teaching for respect and recognition (amiright?! ), but if you have a good relationship with the principal, you are more likely to get these things. Your principal is more likely to praise you and stick up for you when a parent is berating you. He or she is more likely to recognize what you are doing and share it with others (even when you are embarrassed by the attention!). You have a reference (just in case). You never know when you might have to move on to a new school, job, or state. If you don’t have a close relationship with your principal, you won’t leave with a solid letter of recommendation. Here are a few strategies that have helped me nurture relationships with the seven (yes, seven!) principals at my school. Make an effort. The office is far away from my room, so I rarely go there. But when I do, I make a point of stopping to say hi to each principal (and the secretaries, of course). This isn’t much, but it means a lot. All it requires is a smile and a few minutes of your time. Get along with people. Don’t be “that teacher” who the principal dreads to see in the office because you can’t get along with others, be it kids, parents, or colleagues. I send very few kids to the office each year, so when I do, the principal knows there is a very good reason. I have never had an issue with a colleague because to me, nothing is really worth fighting about at work. You’re teaching school, you’re not in school, so don’t do drama. Do your job. This one should be obvious, but just in case, let me sneak it in here. If you have a duty, do it. Call parents if you’re supposed to call them. If you’re not allowed to wear jeans during the week, don’t. Do what is asked of you — it will go a long way. Go above and beyond. If you can do your job, then consider going above and beyond the “call of duty.” Even after I had tenure, I said “yes” more often than I said “no.” Don’t say yes to literally everything; it’s not healthy. Do help out. Chaperone prom, catch a football game, go to the art show, volunteer for the literacy committee, lead your PLC. Invite them to your classroom. Ooooh, this one can be scary! When you feel comfortable with your class or you are excited about what you’re doing, invite your principal to come see you in action. If your kids are giving presentations, invite the admin team to be part of the audience. Even if they can’t come, they’ll know you’re excited about what you do. Always grow and share. Ask to go to conferences, share your passion for classroom management, share your blog, tell them about an amazing PD book you’re reading. Let your administration team know that you’re not only doing your job, you’re learning to do it better. Ask for help. Whether you’re struggling with a particular student or considering a new idea, go to your principal. If they can’t help you, they probably know someone who can. Asking for help is a sign of respect and trust — your administration with appreciate that. But what if your principal won’t meet you in the middle? Our Summer Bootcamp (JUST for Teachers) Starts Here!